According to Oneupweb, 59.1% of consumers expect your website to offer a tax and shipping calculator to help them estimate the total cost of purchase before checkout. Linda’s note: The above image is NOT the client in question. Had some comments about the real problem being the high shipping cost and that was not what we tested in the usability test, nor was this the test site. 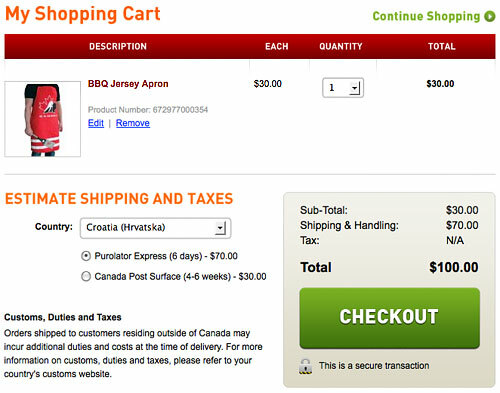 Our consulting practice recently conducted a quick-and-dirty user test for a client and found that 4 out of 4 test participants believed that the tax and shipping estimator was a required step on the shopping cart page – even though the box clearly stated this was an optional tool. And, all had trouble with the feature. The results of this little test is not to be taken as gospel. For one, it doesn’t have statistical significance (nor, as a user test, is it meant to have). But it points out an unexpected area of friction in the checkout process that can apply to any site. Most folks want to see a tax calculator, but 40% don’t expect one. And it’s possible a good chunk of your visitors will believe it’s a required step, which may hinder them from moving through to your checkout if the tool is difficult to use or just looks complicated. It also validates the adage that you can’t expect people to read everything on the web.